The application "Easy Selection“ enables a user-oriented Touchscreen by simply clicking on the objects and adding to a "Shopping cart". The selection of several objects is possible at any time; the total amount to be paid is indicated and can be paid with cash and Debit-/Credit Card. The customer receives a receipt for on which the purchase of the objects (goods or service) is indicated. The application "Easy Pay“ makes it possible to scan a bar code at the machine, which has previously been issued by a manned cash system. The amount to be paid is displayed on the machine and can be settled with a cash and Debit-/Credit Card. After payment, the machine prints receipt, which is delivered to the personnel. 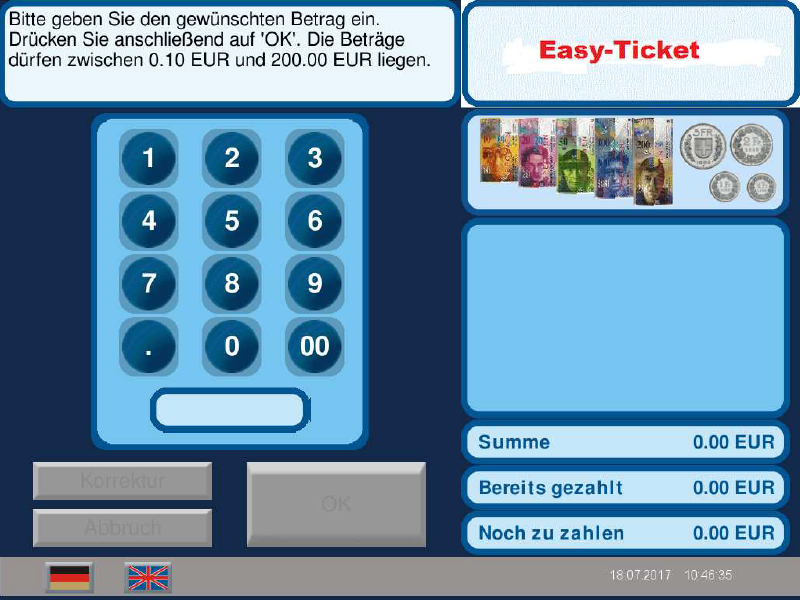 The application "Easy ticket“ enables the input of an amount of money via a Touchscreen which is easy to operate. After the confirmation of the input, the displayed amount can be paid with coins/banknotes. The customer receives a ticket on which the amount is shown. This ticket is considered as proof of the payment of a merchandise or a service. The above applications are available for all machine models.